A long, long time ago (well, today, and yesterday, and tomorrow and every day after that) in a galaxy far, far away (actually right next to Star Tours at Disney's Hollywood Studios), children between the ages of 4 and 12 are given the opportunity to hone their lightsaber skills at Jedi Training Academy: Trials of the Temple! This unique Star Wars show occurs multiple times a day (times listed on every park map and the My Disney Experience app) and it's quite the experience for young Padawans. To get some advice on how your kid is sure to be a part of Jedi Training, I've teamed up with my good friend Janel (@wdw_mom on Instagram!) to bring you some tips and tricks to find out if your kid has what it takes to be part of the Rebel Alliance! 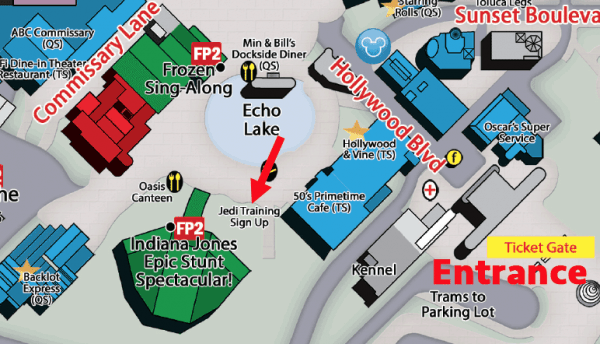 While the rest of the crowds head to Toy Story Mania and the Sunset Boulevard attractions, keep to your left at rope drop towards the Jedi Training sign up location (next to the Indiana Jones themed gift shop neighboring 50's Prime Time Cafe). Slots for this show fill up FAST (usually within the first hour), and it's easier to guarantee your little ones a show spot the earlier you are to sign up. Note from Shannon: Park opening applies even on mornings that Hollywood Studios has Extra Magic Hours (meaning you'll need to be there when EMH begins to sign up). Disney World has often been allowing people to sign up before park opening! If you're early and people haven't started entering the turnstiles yet, look for signs near the turnstiles that might allow you to sign up. If they've started allowing people through the turnstiles but the park isn't fully open yet, look for signs pointing to the sign up area. Every child wanting to be a part of this experience MUST be present at the check in time. You will be given a selection of times available, and your budding Jedi will be asked a series of questions regarding their eligibility to participate (can they listen to direction? Can they answer simple questions? How old are they?). Arrive back to the check in area at least 30 minutes before the show's scheduled time. At this time, each child will be fitted for their Jedi robes and be given a pin with their name on it. You must stay with your child during this time. If you're traveling with more adults, send other members of your party ahead to the viewing area while you stay with your kid during this time. That way, you can see all the fun go down without having to worry about having a good spot in the crowd. Have Memory Maker/PhotoPass download access? Let PhotoPass do the work for you! Each parent is given a PhotoPass card and the photographers do an excellent job of capturing every frame. This allows you to live in the moment, cheering your son or daughter as they battle with Darth Vader without ever having to pull out the camera. 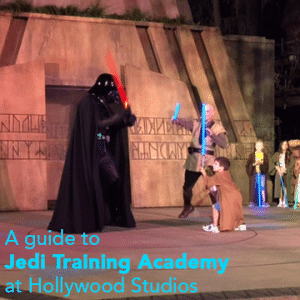 Jedi Training Academy is not to be missed for those Star Wars fans in your family. You may even hear them saying they want to do it all over again! Hope these tips will help for when your kids are ready to join the Resistance. May the Force be with You! We purchased Early Morning Magic for Toy Story Land. Will we be able to sign up between the 7-7:30a check in time? No, and you won’t need to. Easy to sign up after Early Morning Magic ends. It doesn’t fill up like it used to. Hi, Is there a fee associated with this event? Is any souvenir included? And is the breakfast recommendation the best way to ensure no wait in line? So kids have to be able to speak to do Jedi Training? My youngest is Deaf, and while she can understand a lot of spoken language she isn’t able to respond verbally in a way most people understand. Her older brother and sister will be wanting to do this too. Should I have my husband take her to toy story while I sign the big kids up or should I try to see if she can participate too. She loves Star Wars and would be disappointed to miss, but I’d hate to have her wait only to be told no. My son (6 at the time) did the Jedi Training in February, 2016. He was spoken to but never needed to speak back on an individual basis. They may have asked basic questions to the group such as, “Are you guys ready? !” and then everyone would shout “Yeaaa!”. Also, when we went, they didn’t have name tags. I see where this article says they get a name tag. The child might be asked, at the time, what his/her name is. However, Disney is great for making accommodations. I would let a Cast Member know ahead of time that your child is deaf. If she can read lips, maybe ask them to speak clearly and to her directly and make eye contact with her. I wouldn’t want her to skip a fun event because she is deaf. See what Disney can do to work with your daughter. Is Darth Vadar always at the Jedi Training? looks fun! Hoping my kids can do this one day. How long does the show go for? We were at the park 40 minutes before park opening, and the park opened on time rather than early like it usually does. It was so busy that we weren’t willing to wait in the massive line to sign up. We managed to get in by showing up to a performance later in the day, around 3 if I remember correctly, putting our sons on the wait list, and getting the spots of kids that didn’t show up. 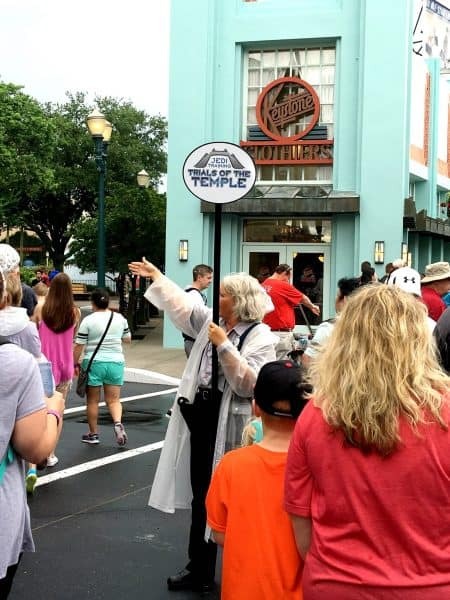 We had 8:00am breakfast reservations at Hollywood and Vine this summer for a Hollywood Studios opening of 9:00am. We were encouraged by the Cast Member at the turnstile to sign up for Jedi Training Academy BEFORE our breakfast reservations! We had our academy slots booked by 7:50am! It was awesome! We were able to beat all the line ups by making a breakfast reservation in the park an hour before the park opened to the public. Walked up to the sign up booth before we went to the restaurant, no line up at all, had our pick of times for the day! I recommend picking one of the early times, save your fast passes for later in the day, and get the kids there early before they run out of energy and patience! Important note: This is NOT a cheap way to go, buffet for 2 adults and 2 kids at Hollywood and Vine was close to $140! We were able to enter the park thirty minutes before opening, sign up, and then wait with everyone else to get to toy story at rope drop. I saw two children miss out On this experience for different reasons. One showed back up to the meeting place at show time. You must be thirty minutes early. The other was shy and unable to answer the cast members questions. And that was after waiting in line for 45 minutes. Know before you go!